Dedicated to the memory of Ted Hughes, the piece is concerned with two poets: their differing backgrounds, personalities and cultures, the respect felt, the reverence generated, the tributes due. Heaney acknowledges the ‘electrifying’ effect Hughes ’ work had on him, knows well his humble background, his modest fortune, his unfortunate private life and his dourness of personality. Heaney has posed a question to Hughes about the time he met T.S. Eliot. Heaney quotes Hughes’ actual response (DOD p.406): like standing on a quay watching the prow of the Queen Mary come towards you, very slowly. Boats on water will resonate metaphorically through the poem. The ocean-liner reference conjures up a welter of ideas and associations: a top-of-the-range Blue Riband ship (fastest across the Atlantic) for a Blue Riband poet, metaphor for a renowned American poet who moved to Europe and settled in London; a massively calm and collected five-star presence; a phenomenon with unstoppable momentum. All in all, Eliot’s name and reputation left the younger poet in respectful awe. So what of Hughes? Heaney watches him rowing his own boat: the middle-class connotations of quay are replaced by pierhead, rough and ready perhaps like Hughes’s modest Yorkshire origins. Hughes does not possess the well-heeled ‘chauffeured’ image he associated with Eliot. He is having to work hard to progress, sitting in a much smaller humbler craft with its cheaper-to-produce wooden, end-stopped stern . In contrast to Eliot’s unstoppable advance Hughes is moving away, sitting with his back to the prow and looking back at those observing him. In contrast with the buoyancy stabilizers and easy comfort of Eliot’s ‘Queen Mary’, Hughes labours in his determination to achieve his poetic aims, as yet only shimmers in pursuit of his desire to ‘shine’, dips (does not yet ‘tower’). Hughes’s propensity to row against the tide, as Heaney sees it, only makes his struggle that much harder for him: making no real headway. Hughes is alleged to have struggled against his ‘demons’ and in view of his failed relationship with Sylvia Plath and her suicide, made little ‘headway’ against his critics. 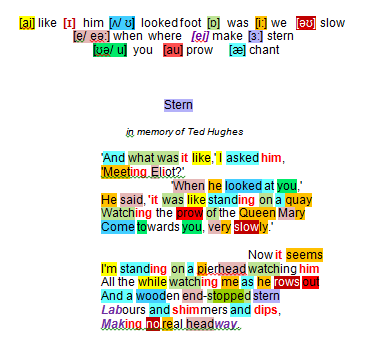 Ultimately, of course, the British Establishment saw fit to honour Ted Hughes as its premier Poet Laureate. Heaney provides insights into his collaborations with and friendship towards Ted Hughes in his dialogues with Dennis O’Donnell (Stepping Stones, pp 390-396): ‘I did feel completely at ease with him; but … to begin with I was certainly that bit shyer’. he was reported as saying that Hughes’s use of language ‘electrified’ him. It is also suggested that he found him ‘gruff’. T.S. Eliot, American poet who settled in Britain, is regarded as one of the 20th century giants writing in English.